For those who aren’t intimidated by active volcanoes, fast paced rafting rivers, or ziplines across the river canyons, here are our best Costa Rica adventure vacations! Stay in three unique Costa Rican destinations: luxury with a volcano view, hiking trails in a cloud forest, and great service with an ocean view. Visit some less popular but no less incredible Costa Rican destinations. A canyon adventure and river tubing will get your blood pumping from the start! Discover the lush jungle around Arenal Volcano, experience the cloud forest of Monteverde, and enjoy sunny Manuel Antonio beach. Tours included! Looking for endless thrill? This vacation has it all: canopy zip line, rappeling, hiking, white water rafting, and more. It's the adventure of a lifetime! This self drive Costa Rica trip is perfect for those wanting to rent a car and see the country on their own. This package is the perfect opportunity to take an extended holiday - out of the ordinary! You'll do things you never dreamed of, experiencing the adrenaline-fueled thrills that make Costa Rica the adventure capital of Central America. The Arenal volcano area and Manuel Antonio are ideal places to enjoy both adventure and luxury. Explore the jungle, go rafting, chase waterfalls and rappel down canyons! Go from the thrill of the city to the majestic Arenal Volcano. Then it's the cloud forests of Monteverde and the beachfront paradise of Playa Pinilla. See Costa Rica's highlights even if you're traveling on a tight budget! This is a great package for frugal travelers, where you'll be visiting equally famous Arenal Volcano area and Manuel Antonio. Start with exciting tours under the shadow of the majestic Arenal Volcano. Then, to Manuel Antonio where you can soak in the sun. In the adventure department, Costa Rica isn’t lacking. These customizable Costa Rica adventure vacation packages are full of excitement for families, couples and groups. Go zip lining over a tropical canopy, white water rafting through mountain canyons, or diving on an island. These are some of the best Costa Rica adventure packages, handpicked to satisfy your need for action. Whether you’re staying in one place or doing a cross-country combo, you won’t want for an adrenaline rush. Every region in Costa Rica offers a great array of adventure activities. The two most talked about are the Arenal Volcano area and Monteverde, but there are also options in Guanacaste. 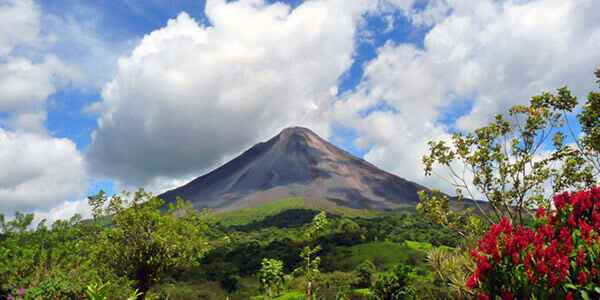 The Arenal region has the biggest selection of activities to choose from. This is why it’s known as the Adventure Capital of Costa Rica. Thrill seekers can enjoy white water rafting, zip lining, waterfall rappelling, caving, or even kayaking and paddleboarding in the Arenal Lake. Horseback riding to the famous La Fortuna waterfall, extreme hiking in the national park, or mountain biking are also popular. How many adventures you get to enjoy depends on the time you’re spending in the area. If you want to experience as many as possible, we recommend doing combo tours in the morning/early afternoon followed by a visit to the hot springs in the evening. In this way, there is plenty of action but also time to relax and recharge your batteries. Combo tours usually combine two adventure tours, such as rappelling and white water rafting, or hiking and horseback riding. There are even 4-in-1 combinations that will keep you entertained the whole day. They are perfect for visitors that won’t spend many days in the area but want to tire themselves with exploration and adrenaline. Monteverde is an area with a distinct, cool climate, typical for a cloud forest. It’s unique weather in the country, with distinct flora and fauna. This makes any experience you may have had before different. Tucked between Costa Rica’s main mountain range and the plains of Guanacaste, water sports are not readily available, but adventure tours aren’t lacking. One of the main attractions is the highest and the longest zip line in Central America! With a length of 5260 ft (just under a mile), this is a great opportunity to explore the forest and commune with nature while gliding past treetops and animals. Guanacaste offers a variety of marine sports and activities. Since most hotels are on the coast, this is the best region for water sports. Sportfishing and scuba diving are world class here but don’t think that is all. North of Papagayo lie some of the most famous surf spots in Costa Rica and all along the coastline, there are places to kayak or paddleboard. Go snorkeling or diving, or set out to sail in a boat to see the sunset or fish for a while. So if you prefer the beach, or if you would like to visit two destinations during your vacation, this is another good area to explore. If you’re up for some inland adventure, Guanacaste also has an array of options. Rincon de la Vieja is just one hour away from the Guanacaste coastline and offers tropical dry forest and volcano hikes. The most thrilling tours here are zip lining over the river canyon and the waterfall rappelling. Alternatively, opt for horseback riding or relaxation in steaming hot springs. For the inner child in you, enjoy the 1200 ft long tube ride through the tropical forest! Another destination close to Liberia International Airport that will awe you with its landscape is the ‘Lost River’ (Rio Perdido). This gorgeous canyon is a perfect secluded spot in Costa Rica. Enjoy here all the adventure you can get in Arenal, minus the crowds. There is even a natural thermal hot springs river passing through the property! Spend days relaxing by the pool or thermal river itself, just so you can later do some adventure tours like ziplining across the canyon, mountain biking, or hiking. Rio Perdido has it all. If you are in search of those areas less frequented by tourists, Costa Rica has great options with adventurous activities. Going to the Osa Peninsula in the South Pacific or to Tortuguero on the North Caribbean Coast can be an adventure in itself. Wind through the tropical jungle on boats by lazy river canals just to get to your hotel in these areas. Once there, options abound. Tour the national parks, visit a waterfall or go diving and snorkeling around Isla Caño. Do a zip line tour and then kayak up and down the lazy rivers of Tortuguero in your quest for a perfect monkey shot. Set out to discover Costa Rica’s unique wildlife in the mangroves of Osa Peninsula, and try to spot the ever-elusive danta that lives in these parts. Still undecided what adventure package to pick for your vacation? There are so many possibilities sometimes it’s difficult to decide which one is best for you and your travel companions. To make things easier, simply email us or call 1-800-606-1860 for a personalized itinerary created by a local expert. Start planning your Costa Rica adventure vacation today! The best example is white water rafting, or Poas volcano and coffee tour, often used when traveling from San Jose. You can travel with connection tours to Central Pacific, Arenal, Monteverde, or Guanacaste.